We came across this zapcar in the lot of Safeway. I try to make my trips to the store on the bikes. We have some great Banjo Brothers grocery panniers that are square and reinforced and can carry a lot of groceries.Â Of course if theres more than two bags worth, the trailer can handle the load.The point is, to not take the car for the short trips. This is someone else’s attempt at making those short trips economically and ecologically sound. 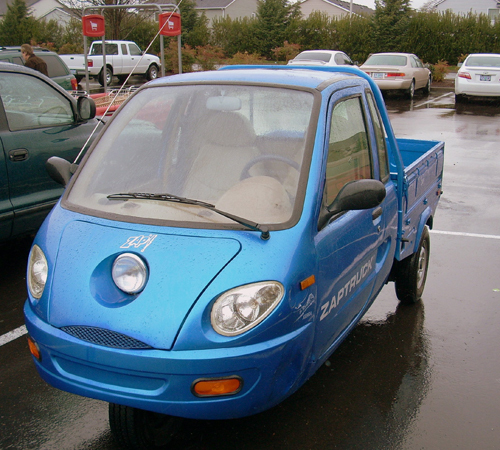 They call it a zap car.Â Honey calls it a truck like vehicle. This entry was posted in Our Environment on March 31, 2009 by golinielcomblog. This entry was posted in Comics on March 28, 2009 by golinielcomblog. Honey likes this The Story of Stuff with Annie Leonard site since its a good example of the kind of web based training using Flash, that can make their presentation both visually interesting and entertaining, and supports the content without getting in the way of the message. I think its pretty cool since its an insightful presentation that clearly explains many of the complex issues concerning the use/waste of our earths resources. This entry was posted in Social on March 27, 2009 by golinielcomblog. We love our Tivo so much we got a second one. Now there are two of them searching, tracking, selecting, and recording all the shows we may want to watch. Waiting for when we have the time and interest to watch them, on our schedule. This came at about the same time that Comcast pushed out their own digital systems requiring yet more equipment to set up, store, manage and make sure they stay connected in just the right way. Requiring installatino of cable cards into our dual tuner Tivo. Mmmm recording two shows at once while watching a third, recorded show…..Â But I digress. This is really about re-organizing and updating the Season Passes in the Honey Monk house. Putting them all down on a list makes it seem like we watch way too much TV. But these are shows that rotate through the season so less than half are actually on the schedule at any time. Plus we only record new shows (except for Divine Design). Some we don’t get around to watching, some are can celled and I just need to clean them up, some are unseen in hopes of replacing the aforementioned can celled shows, but we may not stick with them. Anyway, in alphabetical order…….. This entry was posted in Tivos & Other Technology on March 26, 2009 by golinielcomblog. I first met Joe outside a John Prine concert at Oaks Park.Â I was standing in back next to my bike as he came over to talk bikes. The usual stuff, tires, seats, routes.Â He told me he was a bike writer as well as a bike rider, and I soon came to realize I had read and admired many of his stories. I have met up with him many times since, and have a few of his books, as well as a signed copy of “Metal Cowboy”.Â He is a writer with great sense of energy, humor and what it means to him to ride a bike. I am interested to hear his stories of their family bike ride across Canada. “Mud, Sweat and Gears: One Family’s Rowdy Adventure Across Canada on Seven Wheel”, that should be published this summer. Today, he reviews another bicycling book. Ten years ago, if an established reporter had devoted an entire book to the bicycle as political statement and tool for making cities more livable, publishers would have greeted it with folded arms and awkward silence.Â What a difference an oil war, Wall Street excess, $4-a-gallon gas and a global recession make. But calling “Pedaling Revolution: How Cyclists Are Changing American Cities,” by Jeff Mapes, The Oregonian’s senior political reporter, a happy accident of timing shortchanges it. This entry was posted in Bicycling & Fitness on March 21, 2009 by golinielcomblog. 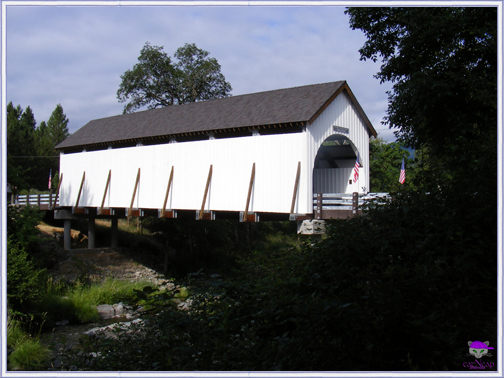 Originally built in 1892, the Wimer Covered Bridge was replaced in 1927. That one collapsed July 6, 2003. Investigators determined the bridge failed because of rotting timbers and from vehicles crossing the span that exceeded the six-ton limit. The new $1.6 million bridge has the look of the original, but with some modern improvements. It is designed to support 10-ton loads, with occasional use by emergency vehicles in excess of that amount. This entry was posted in Spanning the Bridges on March 9, 2009 by golinielcomblog.